December 7, 1941-a day that will live in infamy! When the Japanese Ambassador was visiting with our Secretary of State, he did not know what we already knew-that the Japanese attack on Pearl Harbor had begun. 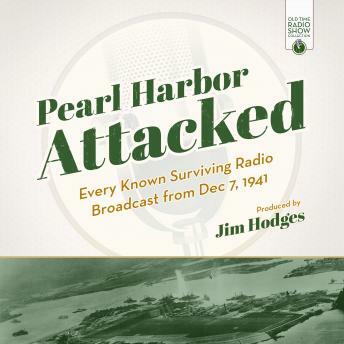 On a quiet Sunday morning in sunny Honolulu, Hawaii, Japanese planes were dropping bombs on our fleet at anchor, our planes on the ground, and the town itself. Our entry into World War II had begun. Listen live as the first reports of the attack come in, interrupting a football game broadcast. The live reports from the scene, the speculation and shock-these broadcasts play in order as they were broadcast throughout the day.